The dome of the Great Hall is pictured at the exhibition Myth Germania in Berlin. The exhibition shows pictures, plans and architectural models of the Great Hall and the north-south axis designed by Hitler's architect Albert Speer during the Nazi regime. It's one of those spine-chilling what-ifs. What if Hitler and his helpers had been successful in their aggressive striving for world power? A new exhibition in Berlin attempts to answer this question in part by looking at the devastating architectural consequences Hitler's success would have had for the German capital. In close collaboration with his confidant and architect of choice, Albert Speer, Hitler sought to cast his megalomania in concrete by radically reshaping the city's center. His dystopian World Capital Germania, in the Fuehrer's own words, would "only be comparable with ancient Egypt, Babylon or Rome. What is London, what is Paris by comparison!" The plans included the construction of two main boulevards, 120 meters (131 yards) wide and running cross-shaped through the city, lined with a number of gigantic buildings, halls, squares and triumphal arcs. "If the plans had been realized," says spokesman Sascha Keil, "Berlin's historical center would have forever been destroyed." The building that best illustrates Hitler's megalomania is the so-called Volkshalle (People's Hall). Around 320 meters (350 yards) in height and covered with a giant dome, it would have been the largest domed building in the world  able to accommodate 180,000 people at once. 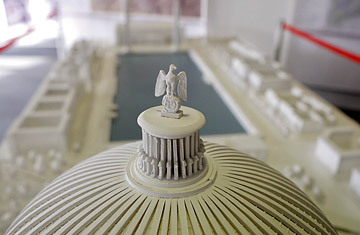 A 3-D model of Germania, originally made for the film The Downfall, a German movie about Hitler's last days, makes its dimensions visible. The Brandenburg Gate and even the Parliamentary Building look insignificantly tiny next to the enormous proportions of the People's Hall. According to Keil, however, the building's size would have led to certain problems: "With all 180,000 seats occupied, the condensed breath of the people would have accumulated in the dome and caused a rainfall." By locating their project right next to the Memorial to the Murdered Jews of Europe, organizers have made sure that fascination with the grandiose nature of the buildings does not turn into admiration. But the location is wisely chosen in another regard. Looking out of the large window you can see the spot where Hitler's Reich Chancellery, constructed by Speer, used to stand. Hitler would often take a nightly stroll through its vast gardens (later, the location of the infamous Fuehrerbunker) to visit Speer in his nearby studio. The dictator and his architect would spend many nights brooding over maps and models of Germania, until eventually the war and its demand for soldiers and material forced them to delay their plans. In today's Berlin, little is left of those plans. A heavy concrete cylinder (built to test the load capacity of the sandy Berlin ground) and the Speerleuchten street lights set up on Speer's order near the Brandenburg Gate serve as reminders of the darkest period in Berlin's history. So do the Olympic Stadium and Tempelhof Airport  buildings not constructed specifically for the Germania project, but that were to be incorporated into the plans. To make space for the mammoth constructions, Hitler and Speer had started to relocate what would have been a total of about 100,000 people. Jewish, as well as non-Jewish Berliners, were affected by this measure: Jewish residents were deported to nearby concentration camps while non-Jewish citizens were merely moved elsewhere. The exhibition sheds a new light on Speer's role  the architect is presented not only as a profiteer, but also an active agent in the resettlement scheme. "Hitler in Speer found a young and enthusiastic executor of his plans," says Keil. Speer and his co-workers at the Generalbauinspektion, the agency in charge of the project, were well aware of the sheer madness of the enterprise. In a series of caricatures, which used to adorn Speer's office walls and are on display at the Berlin exhibition for the first time, Berlin is presented as one huge construction site. In one of the drawings, an oversized building crane accidentally picks up the Reichstag. Another one shows a completely dug-up city center with the caption: "When it all begins, it will be no laughing matter for pedestrians." "It was OK to poke fun at the project internally," says Keil, "but if any of that would have leaked to the outside, somebody would have been in big trouble." But why did Hitler, who had a reputation of feeling more at home in the country's Southern region, develop such an obsession with the German capital? Sascha Keil has his own theory: "Hitler never liked Berlin. He did not like it because only one quarter of its inhabitants voted for him in 1932/33. He did not like the wild parties that Berlin was famous for. He probably gave vent to his hatred of the Berliners by planning the construction of Germania." The exhibition "Germania  Shadows and Traces of the Imperial Capital" will run until December 31.